Our first house guest finally came to stay — an old friend from Trinidad whom I have known since I was in diapers. Now living in London, Katie flew to Koh Samui for two weeks for some much anticipated rest, recuperation and retail therapy, and I was more than happy to play host. Having a friend visit you in a new place is always great fun because it gives you a chance to be a tourist yourself and go to places that you might not in your normal daily life ever go. After all, it is all too easy to slip into routine, and just go to a handful of places that are close by. There’s nothing like having a guest to get you out the house and out exploring. 1. 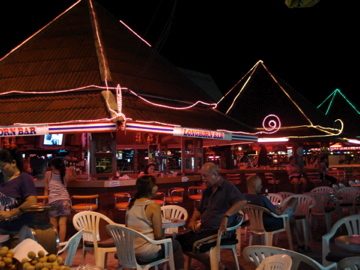 Phad Thai at the Lamai Boxing Girly Bar Area: In the middle of my town is a Muay Thai Boxing ring, located smack dab in the middle of about a dozen girly bars with pink neon lights and girls dancing on the bars. It is also right next to a great little night market area with some amazing and cheap local food. We ate here a lot and never got sick of it. 2. Lounging on the beach: You don’t live in walking distance from the beach without taking advantage of your strategic location. 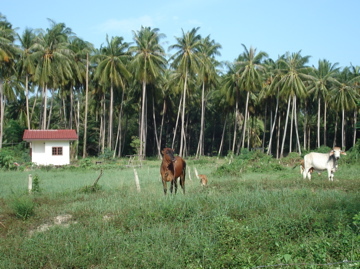 We went to Lamai Beach, and one day also took the bicycles and risked a ride on the main road to get to the Samui Yacht Club which, contrary to the name, is not a marina and does not have any boats. 3. 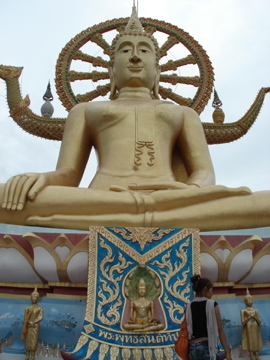 Traipsing in temples: We went up to Bophut, a town on the north coast, and visited The Big Buddha and a nearby temple. 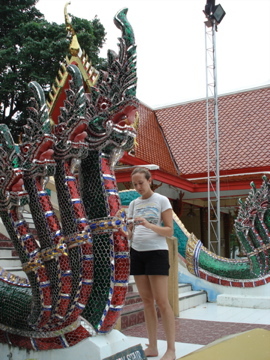 Thai temples are quite unlike any others I have seen in Asia — they are usually extremely bright and colourful, sometimes painted in glitter, covered with mosaics of mirrors, and staircases made a giant snakes. Really phantasmagorical. 4. Hashing: Bob and I were very pleased to get Katie on her first Hash, especially since Bob had set the trail himself that day. 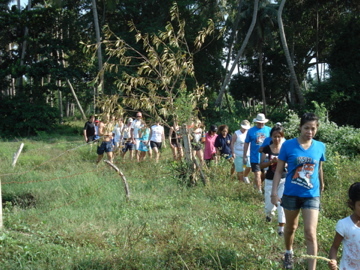 It was a beautiful run through the forest with rubber trees being tapped, a huge field full of curious cows, next to a big reservoir, and back again. 5. 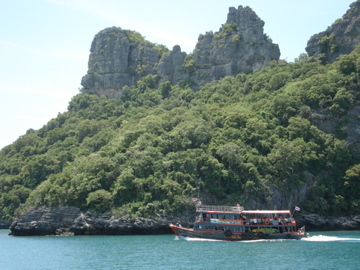 Kayaking: One day we took a trip to the Angthong Marine Park, a protected marine reserve about an hour and a half west of Koh Samui. 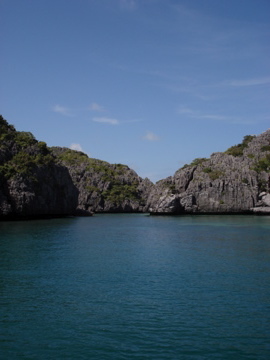 A gorgeous group of little islands made mostly from limestone, the water is absolutely stunning and the kayaking was great fun. 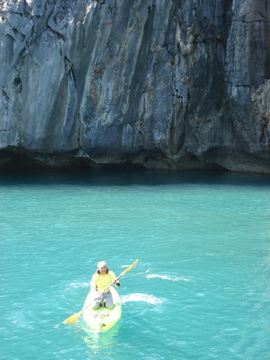 The guide led us through a number of caves, some so low that we had to lie back in the kayak to squeeze under. The snorkelling was all right, but not amazing. 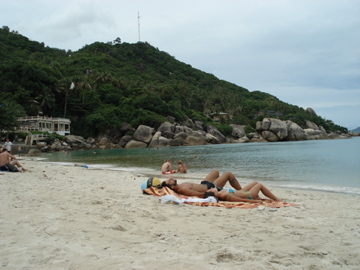 Either way it was really beautiful and I would recommend it to anyone coming to Koh Samui. And now, two weeks are done, and Katie is on a plane right now heading back to London, and today the house is back to single occupancy. I am not sure whether we will get any more guests for the rest of the year, but definitely not I know what I will do the next time we have some people passing through this little island. How wonderful to have an old friend come to visit. Looked like lots of fun, and such beauty! Isn’t it fun playing tourist. Enjoyed reading and glad to know all is going well. Why is there a pot hound on your beach chair right in front of your cute little house.